Having a sore throat can be inconvenient and uncomfortable but it is a mild flu symptom when compared to having a fever or diarrhoea. Nevertheless, it can still be detrimental to your quality of life and has the potential to turn into something more serious. 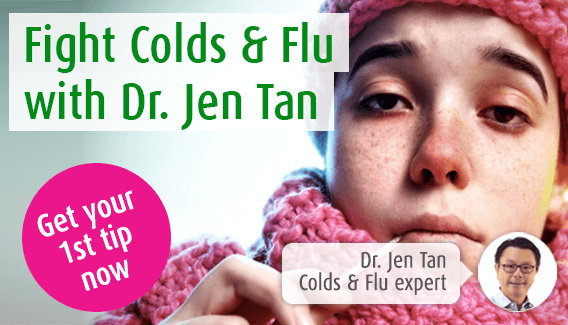 Our immune system expert, Dr. Jen Tan is on hand to discuss why the flu can trigger a sore throat and what herbal remedies are available to ease any pain or inflammation. A sore throat is not usually a serious sign, and is often less troublesome than other symptoms of the flu, such as fever or aching joints. However, sore throats can make swallowing painful, and can worsen a cough, and it is usually for these reasons that people begin to seek relief. Why am I experiencing a sore throat with the flu? However, many flu sufferers struggle to keep hydrated, either because they do not feel like eating and drinking, or because they are also suffering from diarrhoea. This can dry out your mouth and throat, meaning that when we breathe in, the air irritates the lining of the throat, worsening the inflammation. Additionally, if you have developed a cough with the flu, then you are more prone to developing a sore throat. The coughing action is harsh on the delicate lining of the throat, and so prolonged bouts of coughing are likely to worsen this symptom. Home remedies for sore throats often focus on making you feel more comfortable, and of course what works for one person, may be less effective for the next. What is important across the board is that you keep hydrated, as this will also help to prevent the throat from becoming too dry, and more painful. If you do not like drinking plain water, then you could also try warm fluids such as tea, or a honey and lemon concoction. Avoid a dry or smoky atmosphere, and if necessary use a humidifier in your room. This will soothe inflamed airways and reduce hoarseness. You can also try a gargle of salt water. This has anti-bacterial properties. Although your sore throat has been caused by a virus, the last thing you want is a bacterial infection to set in. A salt water solution should help to prevent this happening. Many people look for a herbal remedy against flu symptoms as they do not entail many of the side-effects which conventional medicines often do. Strengthening the immune system helps you to fight off the flu infection more quickly. Echinacea is a plant which has a traditional use in this function. Combined with sage, it can also be effective as a sore throat remedy. This combination is found in licensed herbal remedy Echinaforce® Sore Throat Spray. Are there conventional medicines to help with a sore throat? There is a range of sore throat remedies available over-the-counter. These are often lozenges which contain anti-inflammatory or pain-killing properties. A pharmacist will be able to advise you on the best medicine for you, but it is always important to follow the instructions given on the packet. Unless your sore throat is caused by a bacterial infection, your doctor will not prescribe anti-biotics. This is because the flu is a virus, over which anti-biotics have no effect. Instead, your doctor may suggest anti-viral drugs, Oseltamivir or Zanamivir. You should discuss with him if this treatment is appropriate for you, as it is usually only prescribed for severe cases, and may result in side-effects.